Objective: Complex posttraumatic stress disorder (CPTSD) as defined by the Disorders of Extreme Stress Not Otherwise Specified (DESNOS) formulation is associated with childhood relational trauma and involves relational impairment, affect dysregulation, and identity alterations. However, the distinct contributions of relational impairment (operationalized in the form fears of closeness or abandonment), affect dysregulation (operationalized in the form of overregulation and under-regulation of affect), and identity alterations (operationalized in the form of positive or negative psychoform or somatoform dissociation) to the relationship between childhood trauma and CPTSD/DESNOS have not been systematically tested. Method and Results: In a clinical sample of adults diagnosed with severe and chronic psychiatric and personality disorders (n = 472; M = 34.7 years, SD = 10.1), structural equation modelling with bootstrap 95% confidence intervals demonstrated that the association between childhood trauma and CPTSD/DESNOS symptoms in adulthood was partially mediated by under-regulation of affect, negative psychoform dissociation, and adult relational fears of closeness and of abandonment. 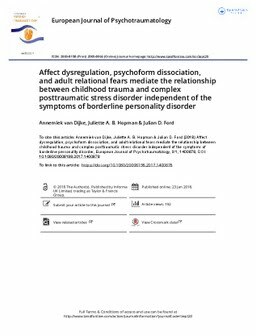 These results also were independent of the effects of borderline personality disorder (BPD) symptoms. Conclusions: Some, but not all, hypothesized components of the DESNOS formulation of CPTSD statistically mediate the relationship between childhood trauma and adult CPTSD/DESNOS. These relationships appear specific to CPTSD/DESNOS and not to the effects of another potential sequelae of childhood trauma BPD. Replication with prospective longitudinal studies is needed.